A December 13 Border Patrol press release headlined: "Border Patrol Apprehends 16 Aliens after Landing in Puerto Rico's Northwest Coast" exposed a much more complicated situation, as we will see. Let's not ask who landed on that coast. Let's ignore the use of landing "in" a coast, rather than on it. 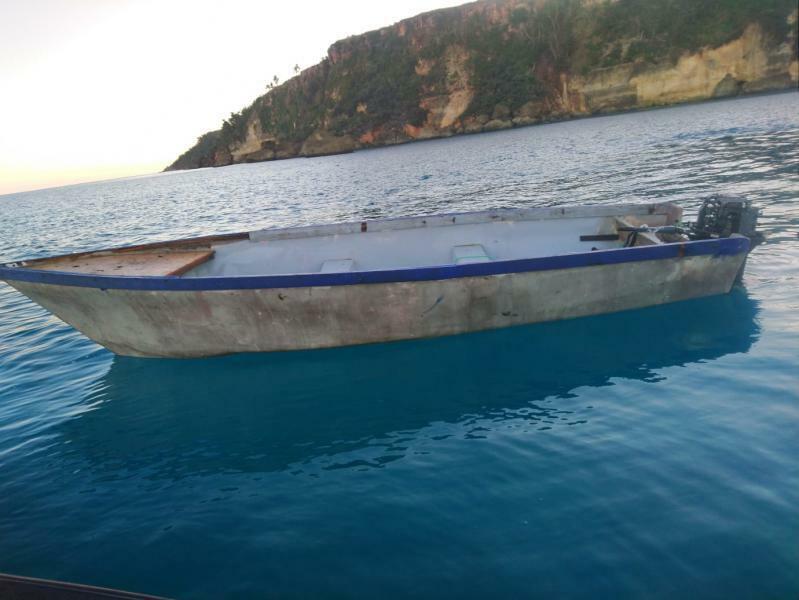 The aliens had managed to cross some 150 miles of open water between the eastern end of the Dominican Republic and the western shore of Puerto Rico in a "22-foot white and blue fiberglass makeshift vessel powered by a 60 HP Yamaha outboard engine", according to the press release. A photo, presumably of the boat in question, shows that it is open, something better used closer to the shore. Why the BP felt it important to tell us the boat's color, and the brand name of the outboard motor, but not that the vessel was an open one or the distance traveled, is another question. What is more noteworthy is the double implications of the desperateness of the would-be illegal aliens and their utter cluelessness upon their arrival on that coast. It all suggests that life for these 16 in the Dominican Republic must have been pretty dreadful. Cluelessness. The 16, through skill or dumb luck, managed to reach the western edge of Puerto Rico, a major feat. Then they, collectively, did something stupid. They all got out of the boat, and then, apparently, let it float away. Now seen from either the land or the air, a boat drawn up on a beach sparks little curiosity. The same boat pulled up far enough on the beach or rocky shore to a point where it could be hidden by shrubs would not be noticed at all. Similarly, a boat that had been deliberately sunk would be, by definition, out of sight. There were at least 16 passengers, plenty of muscle power to hide or sink the boat. But none of this was done. Meanwhile, as at least some of the aliens must have known, the authorities patrol the skies, looking for eastward-bound vessels that may be carrying illegal aliens, and land-bound agents do the same; through one or the other of these methods (the press release is silent on this point) someone spotted the drifting vessel and put two and two together and started a search for the former passengers. And now, according to the laconic release: "All aliens are being processed for violations to immigration law," or as some other person might have written: "All of these aliens are being processed for violations of the immigration law." So an A+ for all the agents in the field, and a D- for the one at the computer.